So 1 went outside to start putting stuff in the car and saw the farmer driving down the road toward us. I told the guys to hurry up, he's almost here and they still didn't come out of the tent. As he was pulling up I said what are you just going to let me talk to him alone... but got no response. He stopped, glared at me, yelled at me in Italian for a few minutes, then asked me if I spoke Italian. I said no and he yelled some more and gestured that he was upset that we had squashed his hay. I must note that sleeping in the hay was my idea. It looked soft. But eventually he was finished abusing me and drove off. Then my three comrades, friends to the end, came out of the tent and immediately began taking down the tent. We were gone by the time he made another loop. (CHRIS) We drove to another pull-off, peed, and brushed our teeth. Then we spotted the hill town of Orte, labeled in "Back Door" as a virgin non-tourist town. It was only 7 a.m., so the town was dead. There were tiny one-way alleys to drive on and great over-looks. (MATT) We walked around town for a couple of hours and watched the town wake-up. We went to Mass and then had a doughnut and a cappachino with the locals. Let me reiterate--there were no other tourists at Orte. No shops, no gelato, nada; just locals and Tumbleweeds. The old ladies were really watching us in Mass. Oh yeah, after Mass a nun indicated that I could have a newspaper. So we sat on the front steps of the church and tried to read an Italian paper. All I got was that something had happened in Bosnia with an F-14, (Mr. Foley confirmed that later,) and they were saying NO to something about the television. We left Orte happy about Back Door Italy and decided to see one more town before hitting Rome. 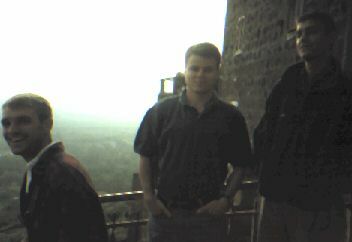 Since we had agreed to see another small town, Jon drove us toward Rome on quiet scenic roads like a bat out of hell. weaving and turning with tires almost melting and engine screaming, we whipped through quiet towns, peaceful towns, and perfect little hill towns nestled a quiet drive from the shadow of Rome's greatness. Chris finally reached over toward the wheel--barely having the strength to overcome the G-forces and the will of Jon Andretti and stopped us at Bracciano, a lake town. It was a nice sized lake with a castle overlooking it. We eventually paddled back to shore, beached our craft, and played hacky sack (Jon watched) for about five minutes 'til some guy told us no and indicated that his beach at least was not one that caters to such activity. He pointed down the beach to where a bunch of young people were hanging out and this indicated that said location would indeed be suitable to our desired recreation. At the time, we did not feel confident enough in our skill to use them in such an environment. It was with this in mind that we turned our faced to the Eternal City and began the final leg or our journey into Rome. Jon drove us into the city and we found ourselves right outside of the Vatican. We spend sometime trying to get hold of Theresa Fedoryka and Fr. Wagner to no avail. Then we tried another of Mrs. Carlson's contacts, the Sisters of Charity. It was a long shot, we knew, but tried anyway. They let us in and we sat in their little chapel and prayed for quite sometime (Jon prayed that they would send us away) 'til they called us out and told us to try some hostels that they knew of. So Jon's prayers worked. We went next to the Seven Hills Campground, 8 Km to the north of Rome. 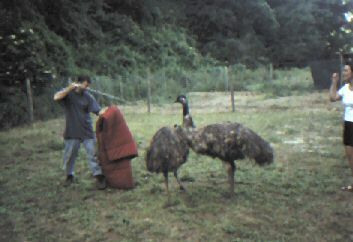 As we unwound, set up camp, and ate, some emu's came up to us. 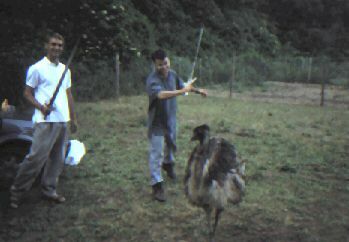 The camp had several types of animals but the emu's were the most noticeable. They are very similar to an ostrich but are smaller (about five feet tall). We soon realized their aggressive nature when it approached our camp and helped itself to our food. Then came right up to Jon and stole the sandwich right out of his hand. We strongly disliked these birds and had dreams of cutting off their heads with Toledo steel. It was at this time we met Treena and Jolie (origination unknown--destination forgotten significance.) Jolie was nice but had major character flaw... friends with Treena (about whom nothing can be said with out being totally uncharitable.) But they told us about the bar and dance club at the campground which later turned into a place of joy and happy memories for all. We made our way to the volleyball court and played with some German kids, then some German guys for a couple hours. Then went back to camp, showered, and as I waited for the other guys to return, Jolie, Treena, and Monica came up. I talked to them for awhile and then agreed to meet them at the bar. We all had a couple of beers and talked to the girls, more of whom joined us. Eventually the bar closed and we went down to the dance club and ended up standing outside talking some more. Sam ended up swing dancing with some girl. Chris and Jon left and I soon followed. On the way out, Monica (from Toronto (25) on a Contiki tour) came with me and we talked for two more hours. We mostly talked religion. She was a cradle Catholic and knew nothing so I told her the tale. It was kind of funny. At one point, she asked me what I believed and I practically recited the Apostle's Creed. She couldn't believe we were for real. Oh well, St. Monica, patroness of conversion, I commend Monica of Toronto to your care. Fare thee well, young searcher.